To say being a doctor is a fast-moving profession is selling it a little short. After the multitude of things on your diary, it can be difficult to keep track of your incoming and outgoing medical referrals. You need a system for tracking this information on behalf of your patients to keep everything in line. Rev-Ignition’s physician and physical therapist solutions bring this kind of control right to you. With the potential to greatly reduce lead times and give you more time with your patient, isn’t it time you gave it some thought? Let’s take a closer look at how you can get the better of your medical referrals. With the right system, you can change the way you deal with them forever. As somebody working in medicine, the concept of a referral won’t be new to you. Primary care physicians send patients to a specialist when they have specific treatment needs. This happens a lot in tertiary care, where a client is referred by their primary doctor to someone with a specific skill in their field. This is often the case with tertiary care, where a client is referred upwards from their default medical care representative. 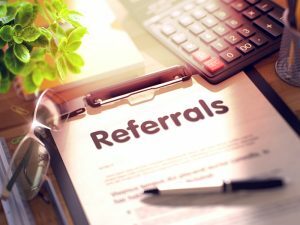 It’s no secret that in the medical community, a lot of business is done based on referrals. But what happens when you lose track of where all of those referrals are coming from? Mishandled medical referrals: A third of all patients every year end up being referral cases. As a result, there’s a big opportunity to create truly meaningful referrals. The problem, however, comes in when these medical referrals are incorrectly handled.Millions of patients experience some kind of mishandling of their cases every year. This results in loss of money and strained patient-doctor relationships. Many physicians upon meeting their patients don’t even know if they’ve seen the specialist yet. Whatever the case may be, these are referrals that have been mismanaged and run the risk of losing the client in the future. Referral leakage: Medicine is much the same as any service industry. When patients with serious illnesses receive confusing service, they go elsewhere.Referral leakage is a serious problem among medical professionals. It’s not only unfortunate for patients but leads to huge financial losses per registered physician over the course of a business year. Now that we’ve identified the problem, how do we go about solving it? A referral management system is a piece of software for medical practitioners to keep track of their patient referrals. It’s a great way to improve communication between unlinked medical institutions. It provides a communication between the doctors and specialists in a patient’s medical pipeline. Everyone from primary physicians to surgeons and specialists gains access to this information. This way, nobody is ever at a loss for where the patient is in their process, and appointments become more reliable to make. Patients deserve to get treatment without having to wait too long to see a doctor. The problem is the average patient visits at least two medical professionals before they arrive at the right office. Between those offices is a lot of opportunity for delays and miscommunications. With a comprehensive referral system, doctors have access to the schedule of diary of the specialists in line to see their patients. What this means is they can push for an appointment when a patient needs prioritizing. Another angle on the question of lead times is misfired referrals. Doctors often direct patients towards specialists who aren’t appropriate for their ailments. It’s a plain industry fact. With referral systems in place to speed the process along, patients spend less time waiting for their appointments. What’s more, other patients who actually need to be there will get quicker access to their doctor’s office. This is one of the many benefits of a system where there are fewer scheduling delays. Streamlining your booking system is step one in improving your patient experience. Without communication between medical practitioners, vital information can get lost between offices. Prescriptions are written out twice, or patients go through unnecessary examinations. This means a lot of wasted time. Case manager services allow doctors to make extensive notes on what they actually did with the patient. They can send this ahead of the referral, giving the specialist insights into their status. To save time, the practitioner can make these notes right there in the room with the patient. This cuts down on time spent emailing and calling after hours. On the topic of communication: referral systems are especially useful for tracking the status of your patient after they’ve left your office. This is not only convenient but can actually be a big help to patients who need to come in for follow-up appointments. This is because, in spite of your best efforts, patients might not come in of their own accord. Any advancement in medicine happens to improve patient treatment. The same goes for a system for streamlining medical referrals. It’s a simple idea. With less time being spent on administrative processes, doctors’ days are more open for them to see and tend to more patients. Modern medicine has given today’s patients more access to life-saving treatments than ever before. With that said, problems with the scheduling still seem to hold the entire operation up. Medical referrals give patients access to specialists and facilities more suited to their needs. Doctors, in turn, get to work with medical practitioners they respect and help each other. With that in mind, it’s crucial that they monitor these referrals to make them as reliable as possible. Tracking lets you follow up on patients, communicate with specialists, and improve consultations. Interested in finding out more about our referral tracking or revenue solutions? Get in touch with us, today, and find out how we can help you streamline your operation!